Some 200 concertgoers enjoyed a spectacular evening’s entertainment in Dunkeld Cathedral on Thursday 14th June when Aberfeldy & District Gaelic Choir joined forces with The Cancer Challenge Singers from Neath Port Talbot in Wales, and the Pitlochry & Blair Atholl Pipe Band. The concert raised more than £2,300 for the local Macmillan Cancer Support, and will go towards the £3 million pounds the charity is hoping to raise for a ten bed palliative care unit, the first of its kind in Perthshire, within the grounds of Perth Royal Infirmary. Macmillan Fundraising Manager for Perth, Kinross & Angus, Sylvia Jeffrey, was thrilled by the event: “It was absolutely superb, quite inspirational, listening to all these people who have the same purpose – to sing, to make beautiful music, and to help people affected by cancer” she said. The Pitlochry & Blair Atholl Pipe Band delighted the audience with several tunes, then marched down the aisle and out into the evening air, to loud applause. The climax of the evening was a joint rendition by both choirs of “Highland Cathedral”, so appropriate in Dunkeld Cathedral, and joined in the last verse by two pipers from the band. A lone piper playing the last bars from the church gallery was all but ‘drowned out’ by a standing ovation from the audience. The choristers closed the evening with the Welsh Choir’s special arrangement of “You’ll Never Walk Alone”, followed by a moving rendition from the visitors of their Welsh anthem “Mae Hen Wlad Fy Nhadau”. 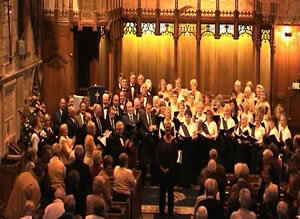 This was the second concert of their Scottish tour for The Cancer Challenge Singers. Two nights earlier they had travelled to Stirling for a concert with Stirling Gaelic Choir. It was a resounding success too, and the highlight of that evening was a superb performance by Anne Lorne Gillies, Scotland’s best loved and highly talented Gaelic singer.